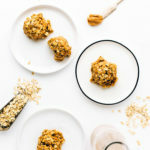 What began as an attempt to make peanut butter millet crispy treats quickly transformed into a love affair with these 5-ingredient no-bake chewy peanut butter oat cookies. The millet crispy treats were immediately sent back to the drawing board due to their lack of crispiness (read: their complete and utter sogginess), but their caramel-like peanut butter coating had me at first taste. The texture and flavor of the coating is divine. Chewy, peanut buttery, caramel-like, smooth, glossy, and just tacky enough to unite whatever it coats. Although it was simply too much for the delicate puffed millet to bear, I had a hunch that it might just be the perfect match for a swath of nutty rolled oats. 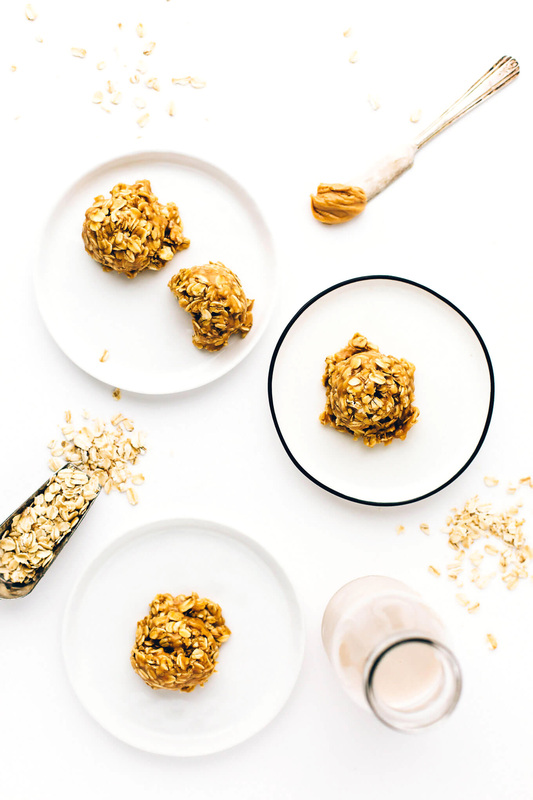 These vegan, gluten-free no-bake peanut butter oat cookies are everrrything. I’m not entirely sure why, but they kind of remind me of a snickers bar sans chocolate. Dan had the same reaction upon first bite, so it must be a thing. A thing that got me thinking that perhaps I missed the mark by not slathering them in melted chocolate. 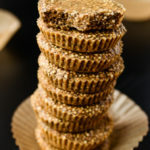 But there’s always next time, and for now, these little treats deserve to be savored just as they were originally dreamt up, in all their bare-naked peanut butter glory. Did I mention they require just 5 ingredients (plus sea salt)? It’s true. And no funny business either. This is one of those recipes that almost feels too simple to slap the “homemade” stamp on and keep a clean conscience about it. Almost. And almost is exactly why we’ll go ahead and do it anyway. 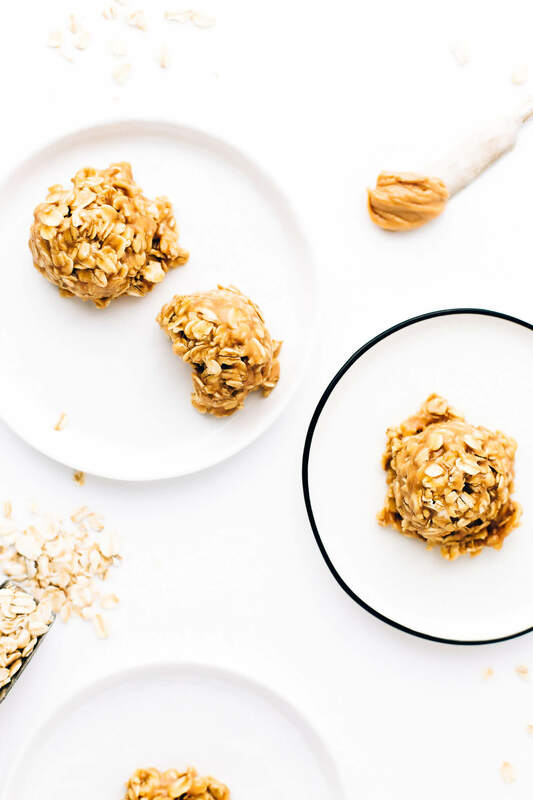 Because really, truly, these peanut buttery treats are homemade. To make them, you’ll start by whisking together brown rice syrup (cannot be substituted) and a bit of coconut oil in a large pot. Bring the mixture to a rolling boiling for just a few seconds, then drop the heat to a simmer and whisk constantly for 1 minute. The mixture will continue to rapidly boil even once the heat is dropped, and that’s exactly what you want it to do. 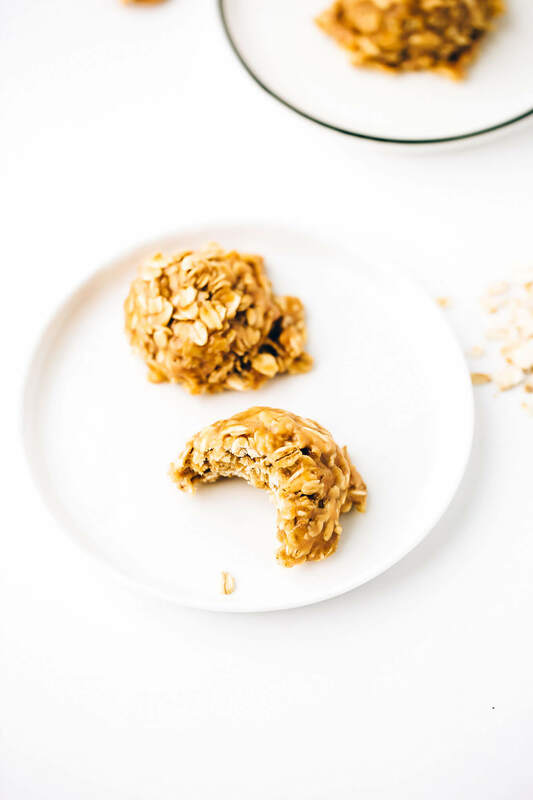 Heating the brown rice syrup now means you don’t have to bake the cookies later, because it thickens and morphs into the perfect no-bake cookie binding texture. Remove the pot from the heat and whisk in creamy peanut butter, a bit of pure vanilla extract, and a generous pinch of sea salt. Once the mixture is smooth, glossy, and caramel-like—and yes, if you want to stop here and use this as a caramel sauce, go on with yourself—you’ll add the rolled oats. Then, stir, stir, and stir some more until the oats are evenly coated in that peanut buttery sauce. It will seem like there isn’t enough sauce at first, but there is plenty. Allow the mixture to cool for just a minute or two. Then, use a lightly greased cookie scoop or spoon to gather tightly compacted mounds of the oat mixture, and drop on a parchment-lined pan. You should have about 22 cookies in total. Pop the tray in the refrigerator for about 30 minutes, or until the cookies are set. Then, savor, enjoy, eat, share, love, swoon, repeat. The cookies will keep at room temperature for up to 5 days but can be refrigerated for up to two weeks. 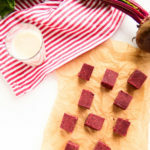 Their texture is optimal at room temperature, so if you decide to refrigerate them, be sure to pull them out about 15 minutes before enjoying to allow them plenty of time to soften. 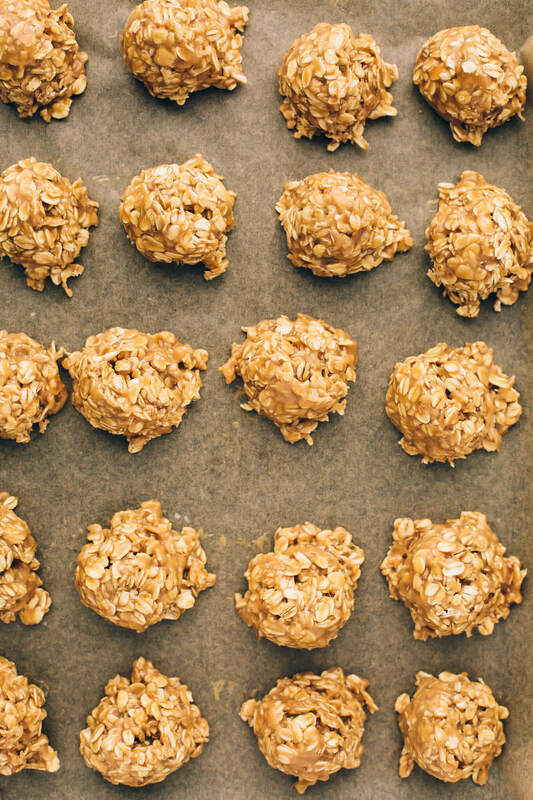 These simple treats require just five ingredients (plus sea salt). Best yet, they come together in a speedy 20 minutes. 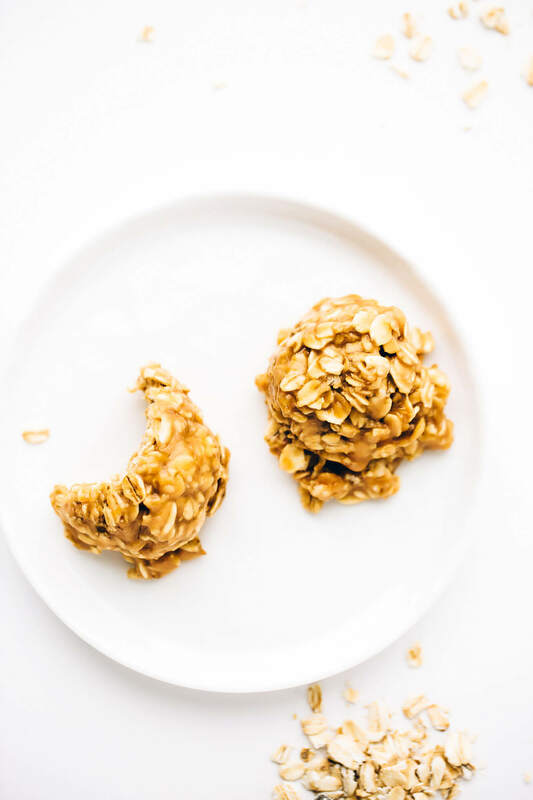 Rolled oats are coated in a rich, peanut buttery, caramel-like sauce. 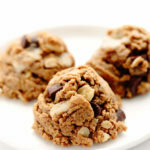 The mixture is scooped out, dropped onto a baking pan, and chilled to chewy cookie perfection. 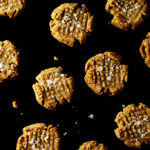 These cookies are sweet, chewy, peanut buttery, and almost fudgy. They're texture is optimal at room temperature, so be sure to give them plenty of time to warm up before enjoying if you opt to store them in the refrigerator! In a large pot or sauté pan, whisk together the brown rice syrup and coconut oil over high heat. Bring to a boil, then immediately reduce the heat and simmer for 1 minute (set a timer), whisking constantly to prevent scorching. The mixture will continue to boil a bit even once the heat is dropped, and that's okay. After one minute, remove the pot from the heat and whisk in the peanut butter, vanilla, and sea salt until smooth and glossy. Add the rolled oats and stir until evenly coated. Let the mixture cool for just a minute or two. Then, use a lightly greased spoon or cookie scoop to drop heaping spoonfuls (about 1 1/2 tablespoons) of the mixture onto the parchment lined pan. Repeat, using all of the mixture. You should have about 22 cookies. If needed, lightly grease your fingers and compact any loose edges into the mounds. Refrigerate for 30 minutes, or until the cookies are well set and lose their tackiness. Store, tightly covered, at room temperature for up to 5 days or in the refrigerator*** for up to 2 weeks. *Brown Rice Syrup is a must as the primary sweetener in this recipe. Other liquid sweeteners (e.g., pure maple syrup, agave) will not work in its place. **No Oil? No Problem. To make these treats oil-free, substitute 1/4 cup pure maple syrup for the coconut oil. Just keep in mind that the cookies will be sweeter and a bit firmer. I much prefer them with coconut oil (read: they're not as good this way), but in an oil-free pinch, this swap will do. 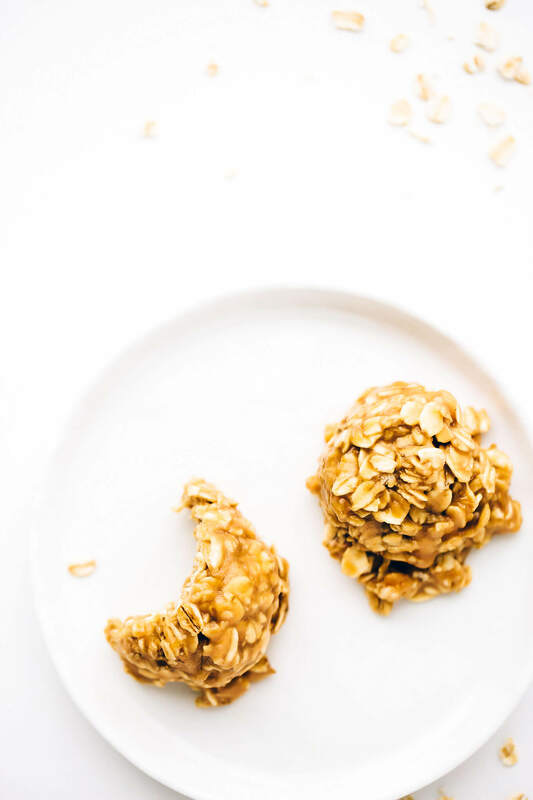 ***If you opt to refrigerate the cookies, be sure to pull them out of the refrigerator about 15 minutes before enjoying to allow them plenty of time to soften. Looks delicious! Can you sub with almond butter? Hi, Mel! I haven’t tried subbing with almond butter so I can’t say for certain, but I have a feeling it’d be fine to make the swap. Enjoy! 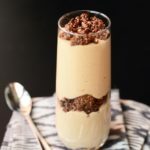 I like the simple list of ingredients and no bake, even better! What a happy ending! I’ll be making these tonight! And I wanted to say, I am so enjoying your cookbook – so many original and tasty takes on a variety of dishes. Oh, Connie! So happy to hear you’re enjoying the book. Thanks for taking the time to share your feedback. Hope you enjoy these cookies, too! Happy (no) baking! 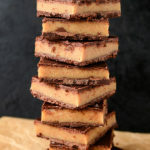 These had a great salty peanutty flavor and were delicious when I first made them. Unfortunately, after cooling down by sitting out a few hours they got too hard for my liking. More hard and chewy, while I was looking for soft and chewy. I followed the recommended version of the recipe. Maybe extra coconut oil or less simmering would result in a softer result. Hmm, so strange. I’m so sorry to hear they hardened up for you. 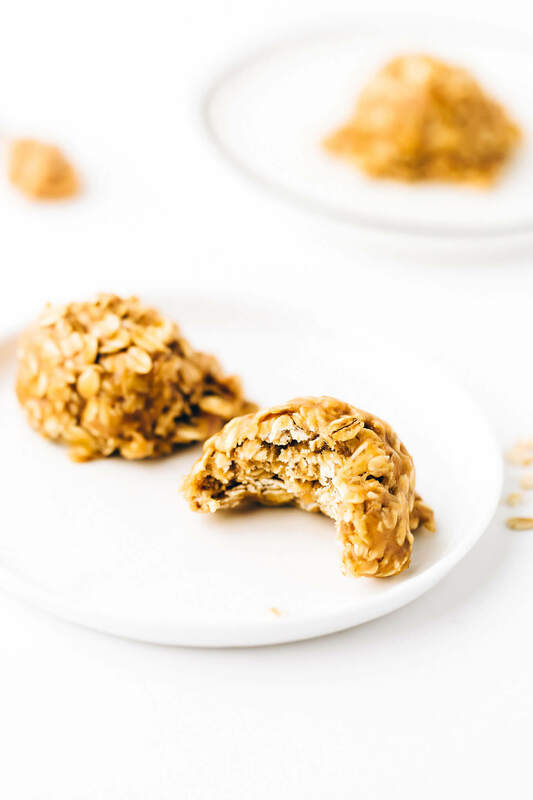 They definitely should not become hard at room temperature—they should be soft and chewy, almost like rice crispy treats but with a chewy, oat-y bite as opposed to a crisp one. If brown rice syrup gets too hot or simmers too long, it will become candied/harden once it cools, but this shouldn’t happen if it’s brought to a boil and immediately reduced to a simmer as noted. Thanks. I’ll have to give it another go! These are super delicious! And I agree; they remind me of a snickers bar. Do you know if they freeze well?